Wooden sword, Bokken or Bokuto? Ask for a "Bokken" in a Japanese Dojo, and observe people's reaction: They will look at you puzzled. What is commonly called "Bokken" in the West, is in fact called "Bokuto" in Japan. This is actually not a real mistake, because the Kanji used for this expression are 「木 Boku」 (wood) and 「剣 Ken」 (epee) and they do refer to a wooden sword. However, the Japanese usually use the term "Bokuto" composed of the Kanji 「木 Boku」 (wood) and 「刀 To/Katana」 (sword). Hence, the difference between these two expressions is only based on the choice of the second Kanji: "Ken" which can either refer to "epee" or more generally to "sword" or "To/Katana" what more precisely refers to the famous Japanese sword, the Katana. To keep it simple and use familiar vocabulary, we are going to use the term "Bokken" in this article. 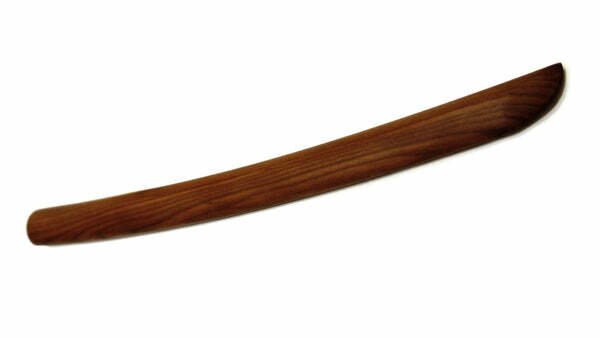 The usage of the Bokken is mentioned quite early in the history of Japan because the Bokken played a practical role. It was needed for sustained sword training and was much less dangerous than a Katana. For a long time it was manufactured on-site in the various provinces where it was used. In the early 20th century with the emergence of the modern martial arts, codified Bujutsu or Budo, its production got concentrated in the south of Japan, in the region of Kyushu, more precisely in a town called Miyakonojo. 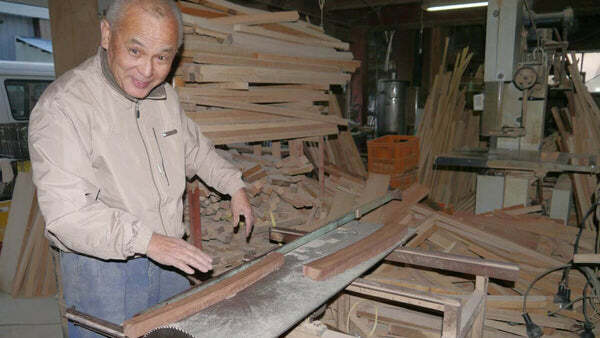 The wood harvested in the forest near Kirishima Sankei is renown for its quality and especially its resilience, the woodworking industry is highly developed and it is therefore obvious that the manufacture of Bokken settled in this region. But the reason why all major manufacturers gathered in Miyakonojo, this one small country town, is forgotten, none of the craftsmen we have met could answer this question. Nidome Yoshiaki, the last great master of art ? All his peers or at least master Horinouchi and master Matsuzaki acknowledge that the best weapons are produced by the workshops of master Nidome. Master Nidome himself says he prefers the work of Master Aramaki than his own. Quarrel of masters! The quality of his pieces, including both, the finish as well as the choice of the material, is without a doubt outstanding. No surprise that he is completely booked for more than a year and customers have to accept long delays. It was a major honour to observe master Nidome crafts a customized Tanto made of Sunuke and let us take a video of the whole process. Jordy Delage : How many steps are there in the manufacture of a Bokken ? Nidome Yoshiaki: Overall about 10. Of course, we first have to select the wood, we purchase in bulk and send it to a specialist to have them cut in planks. This is followed by a 1 up to 5 years drying process depending on the type of wood before it is possible to start the production itself. The first step is to draw the overall shape of the Bokken with a pattern on the planks and then cutting these shapes using various machines. This is when the curvature, the thickness, and the height are decided. Each of these steps is performed thoroughly by regularly controlling all the measurements. Next we have to work on the upper edge of the Mine (the back of the blade) as well as the edge of the blade. These steps are entirely handmade, the craftsmen having about 20 planes available, depending on the desired finish. For this, the Bokken is pinned down at each end, using a tool specially invented in Miyakonojo in the early 20th century for the manufacture of Bokken. Now we have a Bokken with a completed Mine, but without the Tsukagashira (handle) and the Kissaki (tip) and still a little too long. So we start to sand the Bokken with a thick grain until we achieve a rough finish and can control the work we have done so far. The last steps are much faster: We cut off the ends with the traces left by thy pinning and obtain the final length. Then the Tsukagashira and the Kissaki are made with a kind of sanding wheel in only a few minutes. We were highly impressed by this very last stage. Without any marks or other guidance, the artisan creates a Bokken with a truly superb final shape. What is left to do is sanding it with a finer grit, first by machine and then manually to give it the most accurate finish possible and at last polishing it with oil or varnishing it according to the customers request. To finish this Tanto it took about 2 hours, half of it on the machine. Master Nidome states that during the manufacture of 30, 40 or even 50 identical pieces a lot of time can be saved, and the task is completed within 4 to 5 hours, having 2 people work on it. J.D : I guess the manufacture of a customized Bokken takes much more time? 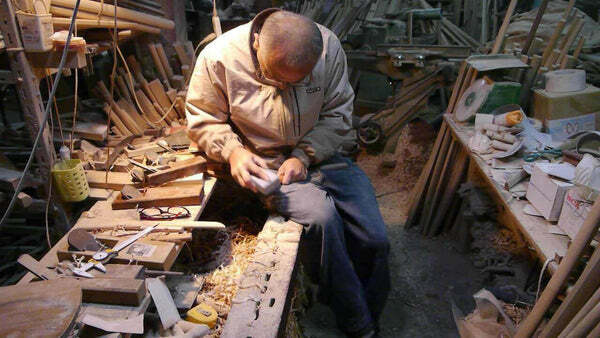 N.Y. : When it comes to make a custom Bokken, you can not make up time, but it does not take much longer either. It also takes about 2 hours to get the final result. The calibration of each machine is time-consuming and in this case it is not less profitable to do it manually, as it was done in the past. If I have only one or two pieces to produce, this is how I do them, if the quantity is larger, it is worth it to adjust the machines. J.D. : So taking in account everything you just said: How many pieces leave the workshop a day? N.Y. : On average, hardly 50 pieces a day because we do a lot of custom orders and that takes much of our time, but we could probably do about the double focusing only on Standard Bokken. It is already 6 pm and we want to devote the last few minutes before our return to the nearest big city to some practical issues. J.D. : What oil do you use for the oil-polish finish? N.Y. : It is possible to use any maintenance oil for wood but I personally prefer camellia oil (Tsubaki Abura), it is easy to apply and almost odourless. I do not like strongly smelling oils. J.D. : As far as I understand, precious timbers like Sunuke are getting more and more rare, how about other types? N.Y. : It is true, Sunuke and camellia are rare and as the drying process can take up to 5 years for Sunuke, it is unclear if we can meet the demand next month. In fact, oak is also becoming rare. The real red oak, now called "Hon Akagashi" (according to the same logic as for the Biwa / Hon Biwa) has become very difficult to find in the region and in some years we will have the same problem for the white oak. So we now collect the timber from all over Japan. J.D. : The wood in Kyushu is well known for its quality. Is there a risk of lowering the quality by using wood from Kanto (Tokyo area) and Hokkaido (northern Japan)? N.Y. : No, not really. We wanted to give a label to the timber of the forest of Kirishima. Its quality is really good, but if the wood is well selected, we find amazing material throughout Japan. Tokyo's Oak is exposed to harsher temperatures and is hence more dense. The drying time is slightly longer and the wood is often a little heavier, however the quality does not leave anything to be desired. J.D. : Your delivery times are very long (laughs). Could you not hire me? N.Y. : (laughs) Look at the size of my workshop! I am always really sorry to let the customers wait, but finally, I am convinced they are really pleased with the quality of our products. If I would hire someone new, I would have to spend time training, checking the quality and would surely not be more effective in the early years and for me, the quality comes first. J.D. : You sometimes manually engrave your Mei (traditional signature) on the weapon. How long does that take? J.D. : Thank you very much for spending time with us. Would you like to add anything? N.Y. : I do not feel at ease with your idea to present our work. What we do here is nothing special, we are just producing Bokken. I trust you in not putting us in the spotlight. We unfortunately had to reject this request. We credit master Nidome's modesty and simplicity, but deeply moved by his knowledge we can not help but bring his skills to the forefront and show his work! Fabrication of a long Tanto made of Sunuke by master Nidome (the Tanto was designed by our team). You can watch how this Tanto is used by Miyamoto Tsuruzo Shihan at the Combat Games 2013 during a demonstration Tanto vs. Bokken. Comparing them with each other he says that in Japan, carpenter stands for great skills and adds, that the strategy in martial arts also needs to be a synonym for great skills. "The Book of Five Rings", Miyamoto Musashi. Executing a technique on a level of art, working on the same movements for decades to achieve mastery that defies science and the understanding of most human beings, this is something, that is in my opinion absolutely similar to what we commit ourselves to as being a Budoka. It is hence not a coincidence that we find the word "art" in martial art. And it makes sense when talking of "Jutsu", technique for Budo, just as we speak of "Jutsu" (Gijutsu) for technical expertise. Knowing ones instrument, endlessly repeating the same gestures and achieve total mastery, at a point where the movement becomes unconscious, natural, evident. These words speak to us Budoka. Taking a Bokken made by master Nidome in ones hand, its balance, its touch, its finess of the finish - it is an impression of perfection, the same feeling we find when we see a master perform a technique in perfection. And if the Bokken is held by the master who achieves to perform a technique on this level, we witness the encounter of a perfect object (Bokken) with another perfect object (the art). This is where art and martial meet. The Tanto manufactured by Master Nidome in the previously submitted video. Oh, and please, don't ask us for a Nidome Bokken if you do not really need the best of the best... webarely get 40 pieces a month, we have to deny about half of the requests we get for his production. Sorry. If you really want a piece from Master Nidome, checkout our our Kanna Shiage (plane finish) Bokken, but be aware that we only offer a few pieces / month, on a first come first served basis, and we never know when we'll get more. This article has been rewritten from an article published in 2010 by our team, enriched by the article we published in Dragon Magazine Special Aikido HS No. 3. In depth video interview, published 3 years later.